Happy (almost) Autumn everyone! It’s that season of cozy that we all love. 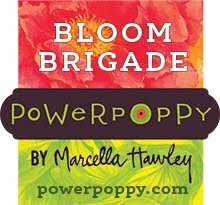 And we’re bringing you a gorgeous new collection of Power Poppy polymer sets just in time for all the goodness that fall brings. 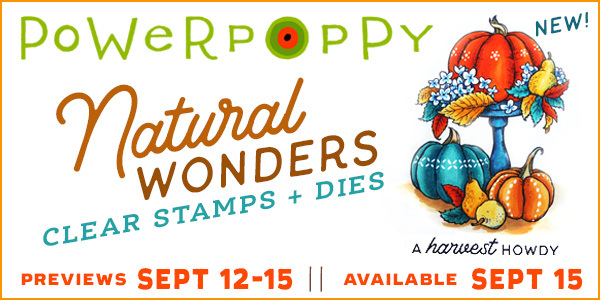 It’s called Natural Wonders, and you’ll find 4 new stamp sets that convey the wonder of this gorgeous world. 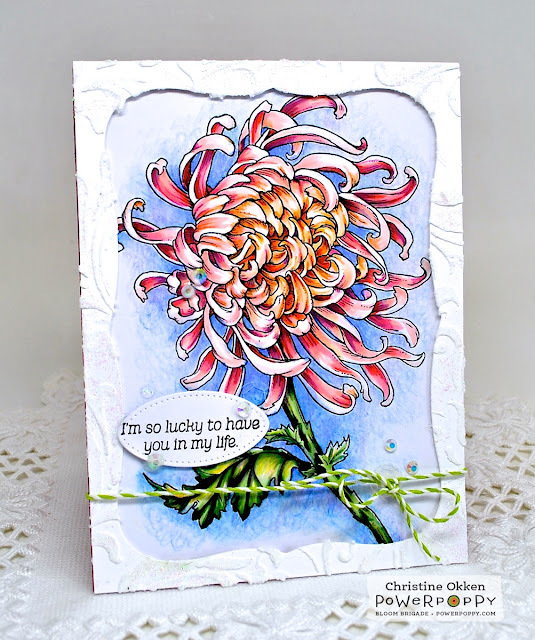 Today we’re kicking it all off with Chrysanthemum XL. It’s a jumbo sized bloom that sings AMAZING! The perfect fall flower. As usual, I get inspiration from lovely pictures I find on the web. I always love when there are two-toned flowers and this one fit the bill. I began with Copics and then finished off my colouring with Prismacolor Pencils to get a little more detail and colour variation in there. With the larger size, you can get into all those pretty petals beautifully. I added some detail in the framing by using a stencil and embossing paste in a pattern that looked like the shape of the petals of the mum. I had a little mishap in creating this one. I wanted to add some sparkly Nuvo Dots, but I was having some issues with my bottle. Low and behold the entire bottle exploded right beside my card and spattered on this on and another one coming up this week. So, I had to make some adjustments like adding that sparkle onto the embossing paste and frame to make it work. I think I rescued it alright! The sparkle looks like it works thankfully. A few clear sequins, gems and a bit of twine to balance the layout and it’s complete. We hope you’ll join us all week for Natural Wonders Previews! Christine this is so bright and cheerful. I like the die cut frame extra you used to frame the bloom, very fun. Beautiful coloring. This Fuji Mum is such a pretty set, and you've really made it look even prettier. What a happy accident that sparkle proved to be! :-) I love the result -- just a gorgeous creation missy! I look at your wonderful coloring and I can just see this mum swaying in a gentle breeze, beautiful job! Beautiful design!!! Love the frame! Such pretty colours. I love the gradation you used. This card is so pretty love all those colours. Thanks for sharing. Beautiful....love the fall Mums...takes me back to high school and the homecoming Queen with the pretty mum corsage. Beautiful card, just love it. Thanks for sharing. I love how you framed it! So delicate and beautiful! I love your card Christine, the image just pops. You are so talented. Love your coloring on the Mum. Great card. Such a beautiful card, and so wonderfully colored! Such a gorgeous flower. And that blue background really sets it off! Beautiful card! Love this gorgeous Mum! Gorgeous card! I love the coloring and the layout. Really pretty card, thank you. Such a beautiful card and coloring! Such a gorgeous card! your colors are just so bright and vibrant too! I also love how your background looks too! Beautiful Card. The shading is perfect. Stunning card Christine! Love your colours! I'm happy you managed to salvage this pretty panel. Such a beautiful card! Amazing coloring and color combination. Wonderful card. Love your colouring.